I saw on the internet that Matrix™ is just pumice. Is that true? 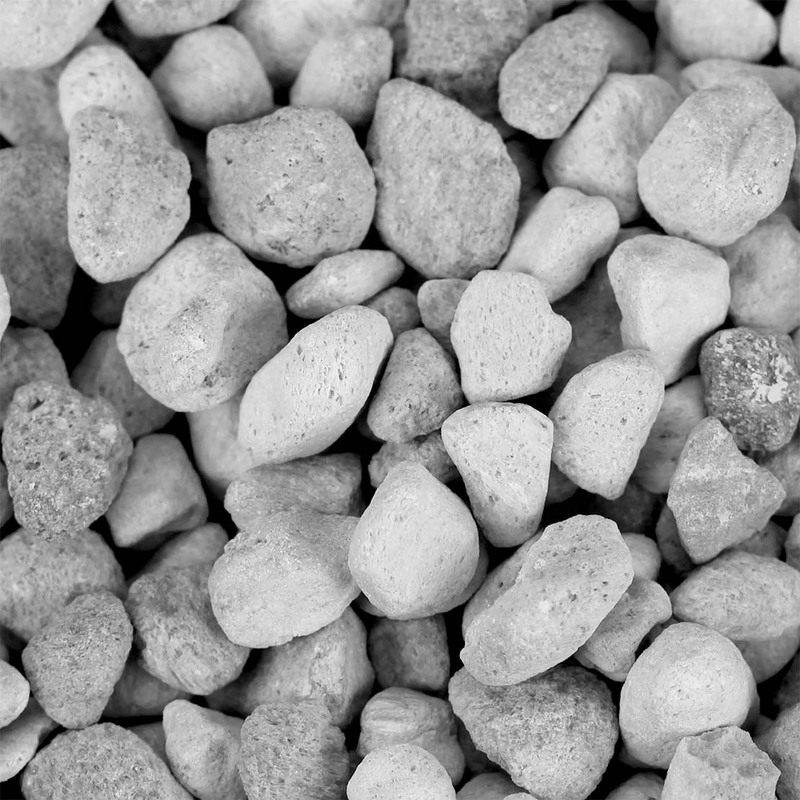 A: We certainly understand why people look at Matrix™ and compare it to pumice; they are both porous stones. But remember, not every porous stone is the same. Matrix™ is a specific type chosen for its extremely high porosity, pore size, durability, and inert nature. When you buy Matrix™, you know what you are getting. It has been tested in the lab and in thousand of hobbyist's aquariums for more than a decade with excellent results. 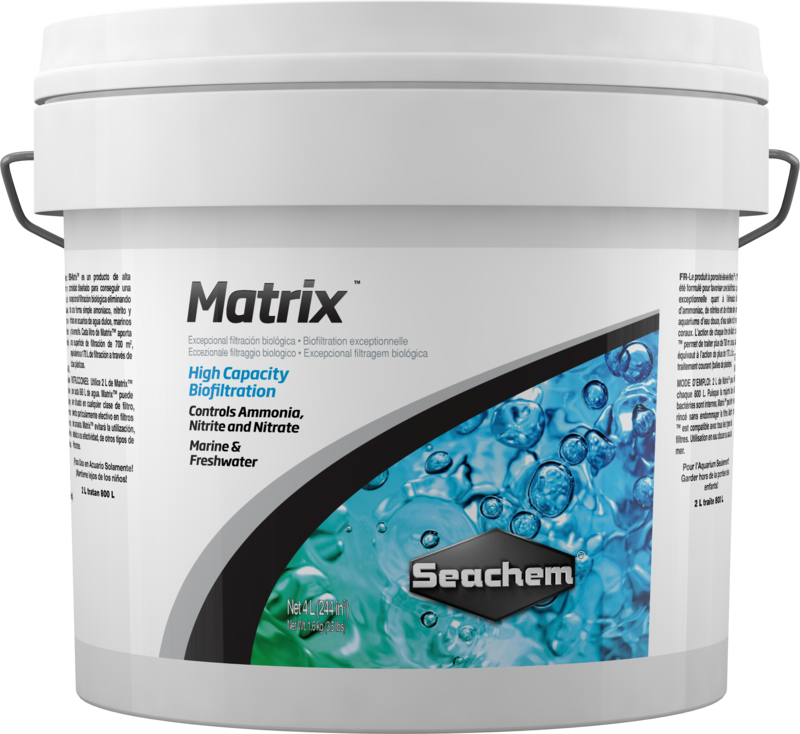 You aren't just purchasing the physical material when you buy a container of Matrix; you are purchasing the research which has sourced and tested this specific type of stone, and the assurance that it is safe for use in your aquarium. I’m using Matrix™, but my nitrates are not coming down, it’s been at the same level for awhile now, what’s wrong? A: Nothing’s wrong. The product is working just as it should. The removal of nitrates essentially comes down to one parameter: rate. The rate at which your tank is producing nitrates and the rate at which it can remove them. If you fill a bathtub with the spigot wide open and try to keep it from overflowing by draining it out of a straw, it won’t be long until it overflows. However, if you drain it at the same rate it fills, the level will always stay the same. Or, if it nearly fills up and then you drain it at a rate faster than it is filling, the level will drop. The same applies to nitrate removal. To lower nitrates you must equip your tank with the capacity to remove them at a rate greater than or equal to the rate of formation. So, if your nitrates are holding steady and you want them to come down, increase the amount of Matrix™ you are using or use de❊nitrate in addition to the Matrix™ (de❊nitrate will more efficiently remove nitrates per volume of product assuming a flow rate of not more than ~50 gallons/hour). If you need to use a higher flow rate, than stick with Matrix™ or try Pond Matrix™, both of which support anaerobic denitrification at higher flow rates. How often do I need to rinse or replace Matrix™? A: Matrix™ is a biomedia, meaning it does not exhaust over time, so you should never need to replace it. That said it is possible for Matrix™ media to become clogged up with detritus and slime, so we recommend regular filter maintenance to ensure it continues working as efficiently as possible. The frequency with which a canister filter needs to be opened and cleaned out varies from tank to tank, but a good starting point is once a month. Where should I put Matrix™ in my filter? Every filter is different, so the exact placement of Matrix™ will vary from brand to brand. Consult your filter’s instruction manual to find the direction of flow for your filter. If I’m using Matrix™ do I need to use de❊nitrate as well? A: That depends on a number of things. If Matrix™ is doing the job for you (i.e. keeping nitrite/nitrate under control) then, no. If you’re running a flow rate higher than 50 gallons/hour, then you won’t be able to use de❊nitrate anyway since it requires a flow rate slower than that to support the denitrifying bacteria. If filter size and capacity are an issue, then de❊nitrate will provide a more efficient removal of nitrate per volume of product (i.e. you can use less de❊nitrate by volume than Matrix™ to get the same denitrifying capacity). Also, de❊nitrate has the capacity to remove nitrates by chemical absorption on initial use of the product, although if nitrate levels are very high (above 20 mg/L) we recommend a water change as the most economical approach to getting your nitrate level down before putting these products into service. 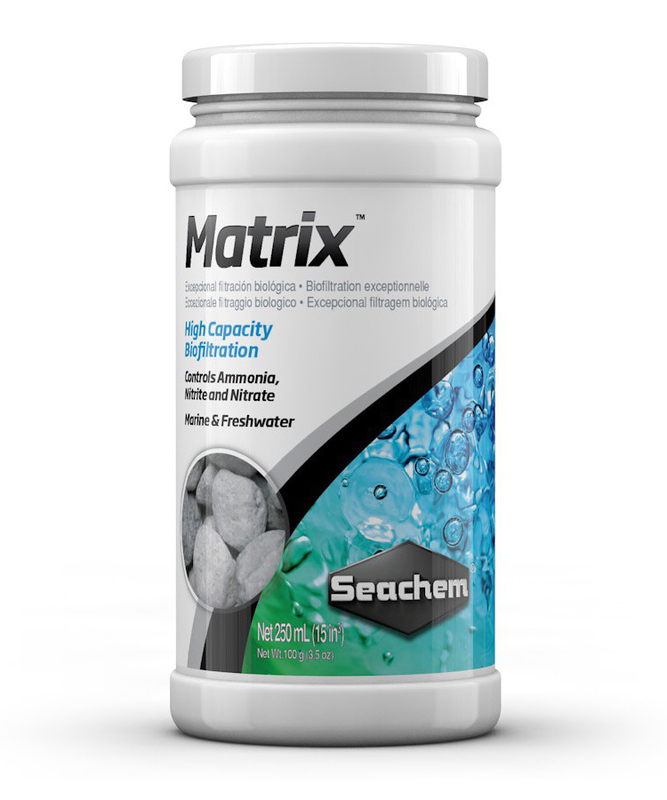 How long does it take for Matrix™ to grow the necessary anaerobic bacteria to remove nitrate? A: This all depends on the stage of biological establishment of your tank, placement of Matrix™ and flow rate. Generally you will start to see improvement in a couple of weeks but every situation varies. If I buy a small hang-on-tank filter, and fill it solely with Matrix™, will that be effective? 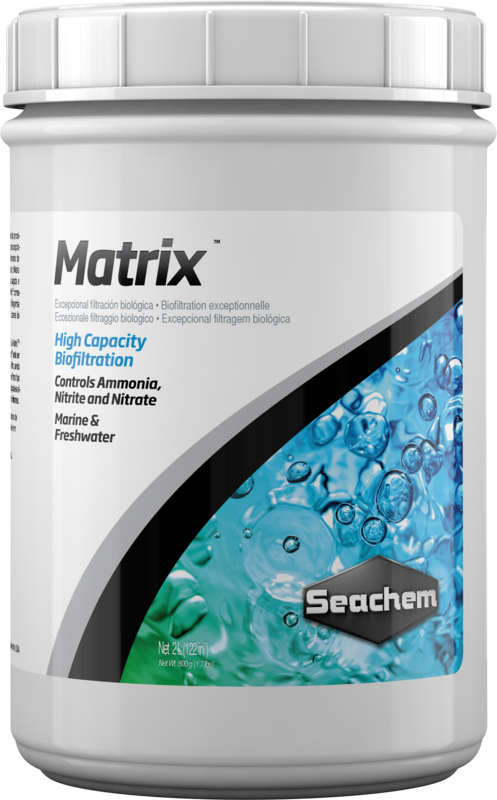 What is the best type of filter to put Matrix™ in? A: It will work but not nearly as well, a canister filter is recommended. Will using Matrix™ affect the pH of the water? A: No, It is an inert media that will not directly impact your pH. Is it theoretically possible to achieve near-zero nitrate levels using Matrix™? A: If you have a fish load it would be extremely difficult to bring down your nitrates to zero (fish foods, waste being introduced on a daily basis). However, it will help maintain your nitrates at lower levels. I received my container of Matrix™ and some of the pieces look darker or lighter than the rest. Is this normal? A: Not to worry! Matrix™ has some natural variations in color and size of the pieces, ranging from very light to quite dark. It is normal to see some color differences from one piece of Matrix™ to the next.